The possibilities are endless – choose how your Superstar Phone looks and functions with our user-friendly phone customiser! How would you like to customise your phone? These are the lines that run across the back of the phone at the top and bottom and tend to match the colour of the screen. This is a piece of either real luxury leathers or carbon fibre and will be fitted on to the middle section of the phone.  Create your dream phone with Superstar Phones and Speak to the luxury phone experts in the live chat bubble below.